What is Vetri-Lysine Plus Soft Chews? 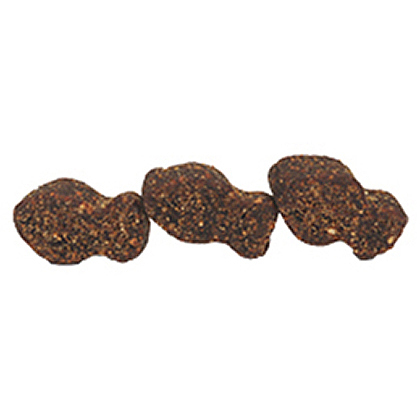 Vetri-Lysine Plus is a chicken liver flavored soft chew that contains L-Lysine, an amino acid that helps control herpes in cats. Along with the ingredient DMG, Vetri-Lysine Plus helps support immune system functioning, collagen formation and tissue repair. The chews are soft and bite-sized, so even kittens can eat them. Vetri-Lysine Plus contains two active ingredients, L-Lysine and DMG, both of which support the immune system. L-Lysine is an amino acid that supports antibody, hormone and enzyme production. L-Lysine also helps control feline herpes, due to its ability to compete with L-Arginine, the amino acid which is required by the herpes virus to replicate. Along with L-Lysine, Vetri-Lysine Plus also contains DMG, which is a metabolite that is naturally produced by your pet's body in small amounts to support the immune response. For animal use only. Keep out of the reach of children and animals. Safe use in pregnant animals or animals intended for breeding has not been proven. If your pet's condition worsens or does not improve, stop product administration and consult your veterinarian. 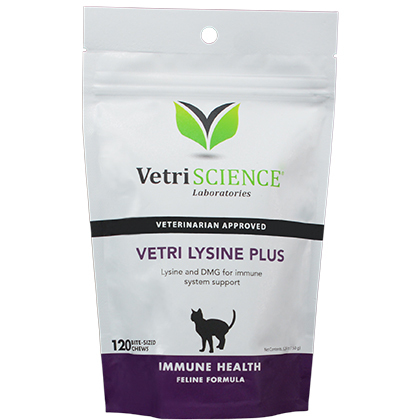 Vetri-Lysine Plus is recommended to support proper immune response in cats. The ingredient L-Lysine can be used to control feline herpes. Vetri-Lysine Plus is a non-prescription (OTC) product. Some pets may consider this a treat. Keep out of the reach of pets. Safe use in pregnant animals or animals intended for breeding has not been proven. Vetri-Lysine is for cats and kittens only. Although some cats consider this as a treat, it is important to only give the recommended daily amount. Contains L-Lysine, which helps control feline herpes. Vetri-Lysine Plus has a chicken liver flavor appealing to most cats. Other Ingredients: Brewers yeast, canola oil, chicken liver flavor, citric acid, glycerin, mixed tocopherols, propionic acid, proprietary blend (maltodextrin, sodium alginate and calcium sulfate), rosemary extract, silicon dioxide, soy lecithin, vegetable oil.